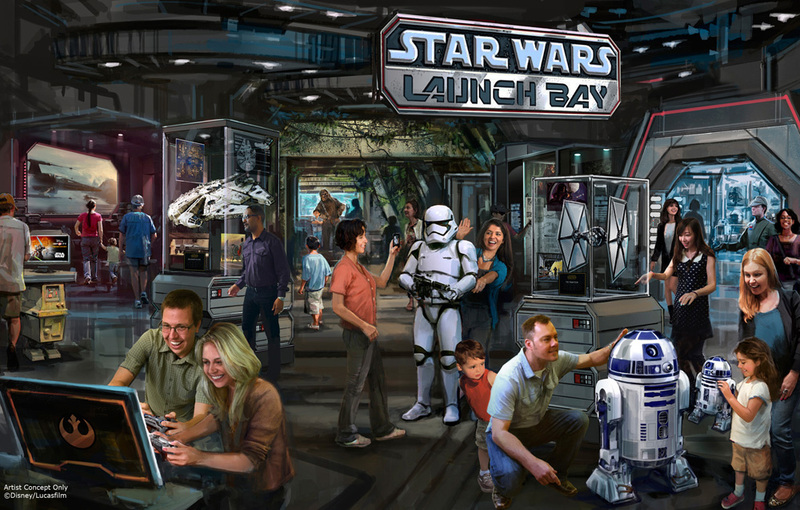 While Star Wars Weekends have always been super popular at Disney’s Hollywood Studios, and the previously announced Star Wars Land won’t begin construction until 2016, Disney is bridging the gab by adding quite a few new Star Wars themed events to the park. Just think of it as The Force is growing stronger at Walt Disney World Resort with the addition of new Star Wars-inspired entertainment. The Star Wars themed entertainment will includes new experiences as well as reimagined elements of popular Star Wars attractions at Disney’s Hollywood Studios, which began on December 1, 2015 – just ahead of the December 18 movie premiere of Star Wars: The Force Awakens. These new experiences involve the creation of Star Wars Launch Bay, a central locale for fans to celebrate all things Star Wars; Star Wars: Path of the Jedi, a cinematic overview of the Star Wars saga; and cool, new enhancements for Star Tours – The Adventures Continue and Jedi Training: Trials of the Temple. Additional Star Wars elements enter the galaxy at Disney’s Hollywood Studios starting December 18 with a nightly fireworks show called the “Symphony in the Stars: A Galactic Spectacular.” In 2016, new Star Wars-inspired food and beverage offerings will debut, plus a Star Wars-themed dessert party. Starting December 18, 2015, guests will be treated to a spectacular finish to their visit to the park involving a dazzling Star Wars-themed fireworks show set to memorable Star Wars music from throughout the saga. What are you looking forward to most out of all the new Star Wars events at Disney? @ Cyndi – If you look at the park hours for Disney’s Hollywood Studios on December 18, the fireworks are listed for 11PM, which is when the park closes. It looks like on 12/20, the fireworks are at 11PM. You should be able to watch them from just about anywhere in the park. Yes, the Jedi Training is just for kids. No fast passes, just show up over where they have it first thing in the morning when you get to the park, they will have a sign up area where you can get your kids signed up for a show, there are quite a few all day, but the slots fill up quickly.